This is in live beta for all to see. Buy xats and auctions not done yet. Comments welcome but we are trying to finish other pages before enhancing much. It looks fantastic, and I love the fact that the powers are classified by categories, so it's easier to find them. And a nice search feature too! . I think this will make lose the essence of fast purchases! Especially in day of launching new powers! It looks pretty cool. I love how powers are being distributed and the search feature as well. 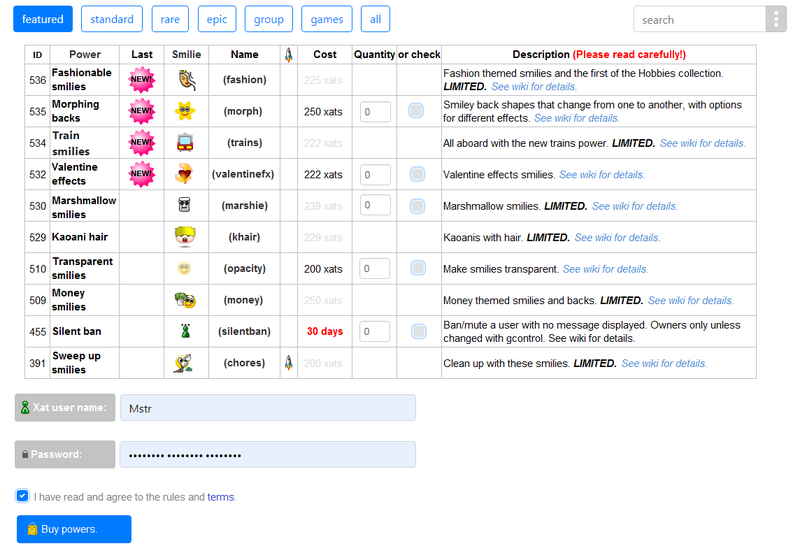 I don't like the checkout thingy because people don't usually use the xat store to buy different powers at once, so I don't think it's needed. For safety purposes, an additional check can be a good thing! People are rushing to buy items within seconds, so this additional check may help prevent one or two accidental purchases. I remember when Big was limited in store and someone bought Redcard by accident. Also, everyone will have the same check, so it's not disadvantaging anyone in particular. And it's useful for convenience sake of course. I suppose only admins will have access to those statistics. We have a trade engine to find several powers cheaper. I don't know those statistics but according to the current system, I suppose we don't need that feature right now if we use my statement as a point of view. It might be good for security purposes but apart from that, I don't see a benefit from it. It looks great! Thank you for doing this! Display the cost of powers, independent of unlimited or limited. It looks really good, the design is simple and pleasing to the eye. It is also much more productive to show the "cart", makes easier the selection of powers. I'm not 100% sure yet but we would have a separated tab for Allpowers, so you can find easily the required powers for Allpowers.